Young people who have teamed up to help improve parts of Keynsham and to tackle the stereotypes surrounding teenagers have completed their first project. 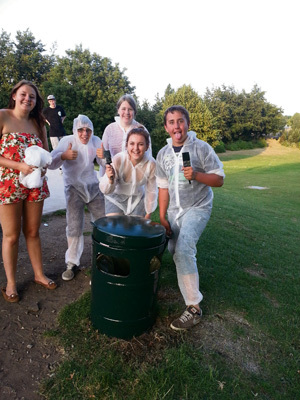 The TimeOut Task Force got to work painting the bins in the Memorial Park, and members now each have a distinctive purple hoodie, presented to them by housing provider Curo as part of its Neighbour Hoodies initiative. Task Force leader Phoebe Bidgood, 16, said: “Our town is a great place to live, but there are some parts of it which are a little neglected and could be improved with just a little work. “That’s why some young people from the town, including myself, decided to start our own Task Force." Keynsham youth worker Mark Willcox said he was pleased about the partnership between Curo and Keynsham Town Council, which would benefit both the young people and the community. Phoebe explains more about the Task Force at www.fixers.org.uk.